10 years ago, I taught myself Ruby on Rails and spent six months developing a local job board. I seeded the site with jobs from Craigslist and paid my local news station $3,000 to run a month-long ad. Unfortunately, all that time and money only brought in 50 visitors a day. I ended up selling just one job post, becoming discouraged, and shutting the site down after a few months. Needless to say, I didn’t know what I was doing, but you’d be surprised how many well-capitalized startups proceed along those same lines today and do even worse than I did back then. It’s because the answer isn’t in spending large sums of time and money. It’s in running cheap and measurable tests that provide the market feedback you need to keep cranking on your ideas. Here’s how my latest project Old Geek Jobs made $2,000 in a month and a half by running cheap experiments. On September 15th, I read Tim Bray’s “Old Geek” post about ageism in tech. It struck a chord because I experienced what I felt was age discrimination interviewing with a startup run by 20 year olds. 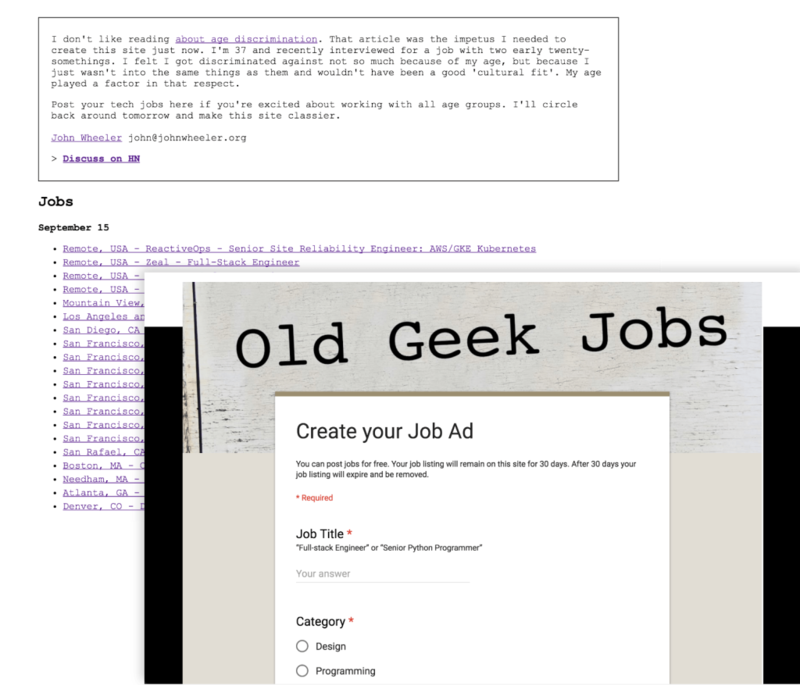 I registered the domain name OldGeekJobs.com for $9, fired up a $10 Digital Ocean instance, and uploaded a Google form embedded in a static site. My site was posted to HackerNews and collected over 500 upvotes. The next day, Quartz wrote a piece followed by another from Evil HR Lady. Employers started submitting jobs, and I copied and pasted them from the Google form to the static site. I wasn’t making any money because the job posts were free, but in less than a few days, I had the feedback I needed to move forward on my idea. Over the next few weeks, I began developing a more robust version of the site using jQuery, Python, Flask, and Postgresql. I broke out jobs by city and state, added real-time keyword search, and added an innovative quick preview feature. The Elephant in the Room — Will It Make Money? I made it $50 to post a job. Employers post the jobs highlighted in green directly, and that’s how you know they welcome all ages. 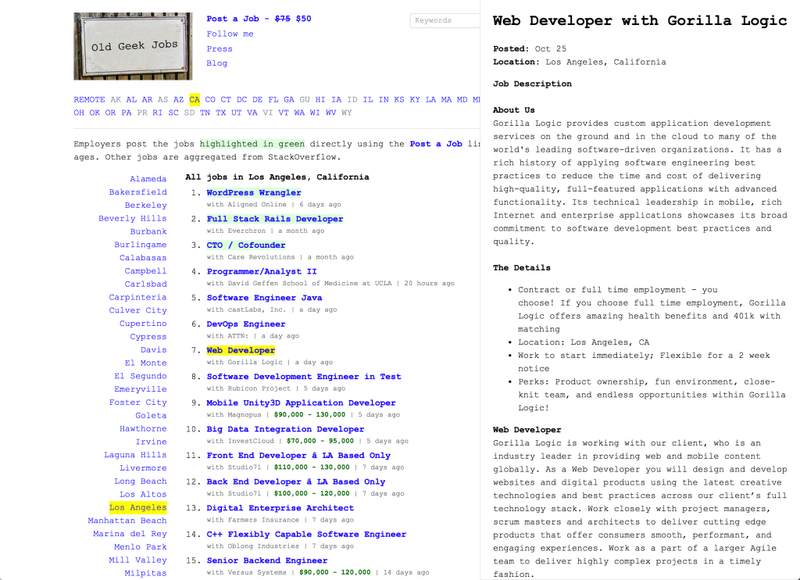 Other jobs are aggregated from StackOverflow. Here’s the kicker though: at first, the $50 price tag was just another experiment—employers were still able to post for free. I didn’t expend any effort implementing payments until I could prove employers would be willing to pay. They kept posting, so I spent the next day implementing Stripe. That was 28 days ago, and I’ve sold $2000 worth of job posts between $25 and $50 a piece since. Now, I divide my time 50/50 between hacking on product and driving traffic with Medium posts I share on Reddit and HackerNews. So far, two posts have made the HackerNews front page. If you’re on to something, sharing your story and results is a cheap and effective way to bring targeted exposure and feedback, but you must be discriminate with the feedback. You can determine a lot more about what people want by what they do, rather than what they say. As an example, a person suggesting on a message board that I build a resume database is a lot different than 10 employers who pay for job listings, writing an email asking, “where is your resume database?”, and then requesting a refund when I tell them I don’t have one. The former feedback needs testing. The latter is indisputable. Don’t be afraid to decline requests that are obviously good but stretch you too thin. People are OK with you telling them no, as long as you share your reasoning. For example, requests have come in to make versions of Old Geek Jobs for other countries. Since I put out a version for the United States so quickly, internationalization seems like a no-brainer—a cut and paste operation even. But, the developers asking can empathize when I explain that what sounds easy on the surface opens up a can of worms in practice. I don’t know their geographies, customs, and languages; I’m not familiar with the media outlets I’d need to market to, and want to focus on making one great product instead of a dozen half-assed ones. I explain it’s the best shot I have at getting resources to internationalize the right way. Finally, I tell them, if they’re so inclined, they should try to build out their own variation. You might think I’m crazy for welcoming competitors, but I’ve learned from my current business that success invites competition anyway, execution is what’s actually important, and the best way to compete is having a laser-like focus on the things under your control. I’ve also been asked why I don’t redesign my site to make it more modern and why I use jQuery instead of Angular or React. It’s because speed and simplicity are the two most important features, and I’ve intentionally made the site sparse to keep its loading time under 300 ms. I use jQuery because it’s simple and powerful enough. Angular 2 clocks in at a 700+ KB download with webpack, and I don’t have time to learn React. Moreover, my site isn’t complicated enough to warrant those. Just because you have a hammer doesn’t mean everything’s a nail. With Old Geek Jobs, I attribute my results so far to the things I didn’t do, versus anything I did. I didn’t spend a ton of time on product. I didn’t spend any money on employees and advertising. Instead, I used my coding and writing abilities to quickly build something along with an audience around it. I’m experienced enough to know the modicum of success I’ve had won’t mean anything unless I keep pushing hard on my idea. At the same time, my progress is significant because it’s taken me 10 years to understand the Internet doesn’t care how much time or money you spend; it only cares about the value you provide. Don’t needlessly waste time and effort on your projects moving forward. Run cheap tests before you build and share your work early and often. John Wheeler is the creator of OldGeekJobs.com. Heâ€™s been self-employed since his eBay Feedback Reminder took off 5 years ago. Before that, he managed software development at Xerox. In his free time, he works on open source Python and blogs on Medium.